We have bred all types of beautiful birds for years so we understand what it feels like to wake up in the mornings to the sounds of singing birds. Have you ever listened to the birds singing in the mornings? Living in the country areas most people can tell which bird is singing just by listening to their song. The birds I remember most as a child was the Kookaburra, we kids tried to copy his laugh. The Magpie is another well-recognised bird sound. I believe this is where my interests in birds started. Mum bought us a small cage and we had a pair of budgerigars, which I tried to teach to talk although I soon realized that a single budgie will learn to talk, whereas a pair of birds will have each other for company so will not be interested. If you would like to have or breed birds in your back yard then do your research and look at the many options and pros and cons of either building or purchasing your aviary, before jumping straight in and buying the first one you see on an impulse. Consider all your options before wasting your money on something that will not suit your needs. The Crimson Parrot in the picture below is one we had for many years, these are beautiful birds. Whether you buy or build your own aviary you need to ask yourself - Do you want to keep a couple of birds as pets? Or would you like to breed a variety of birds in the future. Do not spend your money on a small aviary with small mesh if you will want to keep large Parrots next year. Large Parrots will chew their way out if using fine wire in no time. If unsure, choose an aviary with strong mesh to start with. You may decide on Canaries or Budgerigars now, and then next year you may choose to keep larger parrots, which would need a stronger mesh. If this is the case you will not have to buy another aviary or have it rewired with the stronger mesh if you buy this one in the beginning. Galahs need a steel mesh as they will chew through the normal wire and escape. Finches, Budgerigars or any small parrots need the normal 1 cm x 1 cm wire mesh sold in most hardware stores. This type of mesh is strong enough for them. Indian Ringnecks, Eastern Kings, Crimson parrots, Cockatiels and similar parrots will need at least a 1 cm x 2 cm mesh wire. If building your own aviary, when wiring your cage make sure you fix it so the length of mesh is up and narrow is across. The opposite to that in the above picture. I say this as it lessens the risk of snakes gaining access by flattening themselves to slither into the cage. If you intend to keep lovebirds, you need to consider putting an extra layer of wire between their cages, with a space between the wires. These birds are very affectionate, yet aggressive to each other. They will chew the feet off of any birds landing on wires next to theirs if not separated. Frames - The handy type of person can build their own aviary. The decision to make it out of steel struts or wood is entirely up to you and the climate that you live in. Steel will last for years, where White ants could infest the wood frames or it could rot. Flooring - A slanting concrete floor is the best and easiest to clean. This also helps prevent the mice or rats from coming up through the floor. Design – The design is not as important as making sure that you protect the birds from the wind and drafts. Therefore, when building your aviary, cover the back, top and both sides with metal, this protects them against the strong winds. I would suggest that you close in the bottom, right around the aviary about 20 cm high to prevent mice and other predators from entering. This will also prevent baby quails from escaping as their very tiny and can get out through the smallest wire mesh. If not handy with your hands then I suggest you buy one already built. This way all you need to do is decide on the right position in your back yard, and the type of flooring. Then set it up with your perches, feed and water, and of course, your birds. You could buy a new aviary from a manufacturer or watch the classified adverts for a bargain. Do not buy on impulse and settle for something, that is not suitable, or you will be disappointed? There are hundreds of different shapes and sizes of aviaries to choose from. Some designs come with a stand and suit the back patio. If looking for something to make a feature of in your back garden then a hexagon design aviary would look effective. 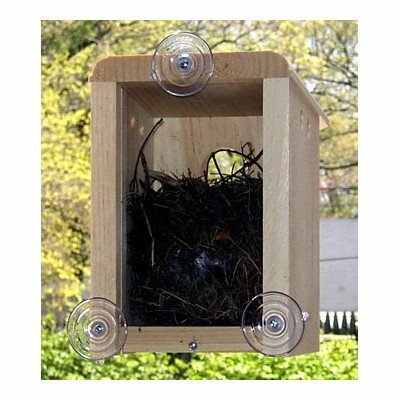 This would be ideal to watch the little birds build their nest and raise their young. Comes with the box and three suctions plus to stick on your window. Place on window that is not open to strong winds or hot sun. Birds need protection from strong winds and rain, as they can’t hide in the trees like they would in the wild. This picture of an aviary shows the back area with half of one end closed in still allowing birds enough flight in the sunshine. I hope that this article will help you to make the right decision on whether to Build or buy your own aviary. Plus it will help you to decide on the right one for your birds to live in happily. 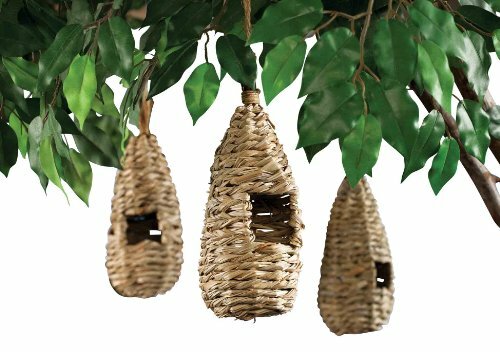 These little nests would be ideal hanging in your aviary for small birds like finches, or from a tree for the small wild birds to nest in. Almost ten years ago, my partner and I build our budgies a cage. We did not like the small sizes of nearly all commercial cages. The one big con we experienced, other than both being completely new to birds, was taking maintenance into consideration. It's a beautiful, large build for budgies but nearly impossible to clean easily - despite two doors and bottom pull outs. Thanks LittleTwoTwo, Yes a lot of thought needs to go into the way you build it. And some of the ones you buy definitely do not have caring of the birds first. We all learn by our mistakes. And after building and moving aviaries from place to place with our many moves. We learned more each time. The mice were one of the big problems too. Our son came up with a good idea for trapping them he dug a bucket into the ground and as they ran across they would fall in and could not get out. The downside to that was we still had to kill them or leave them to die. Thanks for stopping by. Thanks Multiman, Yes, I think it could cause a problem, if you have an aviary beside your home then I think it would work but not for wild birds. Some of the zebra finches and birds like them don't worry about people watching them. Where as other birds do not like to be disturbed. You have to use common sense with this type of thing. They would work in theory but I believe they still need a bit of privacy on base of nest.